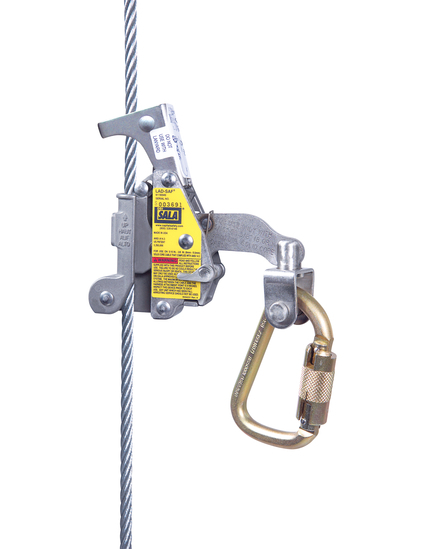 A flexible cable ladder safety system consists of a top and bottom bracket that act as anchors for a steel cable that runs the length of the climbing area. 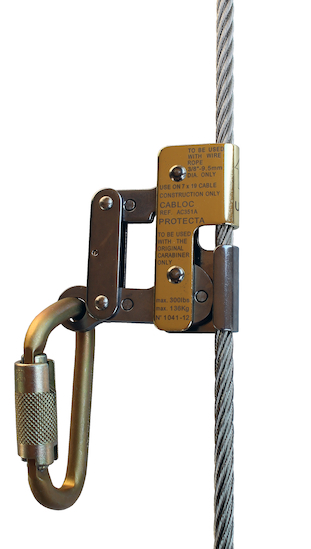 The Cabloc™ sleeve connects the worker to the system, automatically follows the user during the climb and locks onto the cable in the event of a fall, allowing the user to regain their footing. Designed for ease of use, economy and versatility, options are available for 3/8” (9.5 mm) or 5/16” (8 mm) cable lifelines. Protecta® gear provides a combination of practical affordability and simple compliance. Other Standards Capital Safety Gen. Mfg. Req. Fixed ladder safety system, galvanized, top bracket with energy absorber, bottom bracket with tensioner, cable lifeline and guide(s), safety sleeve.